Createspace Independent Publishing Platform, 9781494882273, 128pp. I had experimented with personal development strategies for a decade. When I accidentally started my first mini habit-and the changes I made were actually lasting-I realized the prior strategies I relied on were complete failures. When something works, that which doesn't work is exposed. 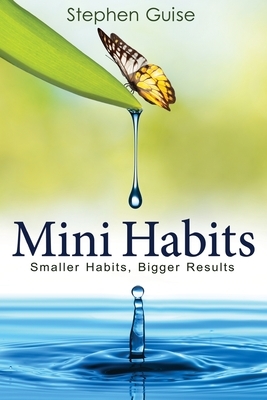 The science in Mini Habits exposes the predictably inconsistent results of most popular personal growth strategies, and reveals why mini habits are consistent.A mini habit is a very small positive behavior that you force yourself to do every day; a mini habit's "too small to fail" nature makes it weightless, deceptively powerful, and a superior habit-building strategy.Mini Habits will better equip you to change your life than 99% of the people you see walking around on this globe. People so often think that they are the reason they can't achieve lasting change; but the problem isn't with them-it's with their strategy. You can achieve great things without the guilt, intimidation, and repeated failure associated with such strategies such as "getting motivated," resolutions, or even "just doing it." To make changes last, you need to stop fighting against your brain. When you start playing by your brain's rules-as mini habits show you how to do-lasting change isn't so hard. Stephen Guise, the author of "Mini Habits: Smaller Habits, Bigger Results," founded the award-winning* Deep Existence blog in 2011. He has been writing about personal growth since 2004. Since he started sharing his ideas with the world, his well-researched articles have been featured on some of the world's most popular websites, including: Lifehacker, Problogger.net, Tiny Buddha, Dumb Little Man, and Pick The Brain, among others. Fueled by his passion for personal growth and a penchant for in-depth research and analysis, Guise has developed an array of unconventional, result-driven ideas. In particular, his ideas of extreme willpower conservation, non-motivation-based action plans, multiple-cue habit formation, success-cycling, and "stupid small" steps form the unique foundation of his first-published--and second overall--book, "Mini Habits." *Deep Existence was voted the #1 personal development blog of 2012 by White Dove Books readers and staff over 22 other nominees.